Magnetico by ABET LAMINATI is a magnetic writable surface suitable for applications in education, medical, hospitality, workplaces and the home. The high gloss HR-LAQ finish creates a clean crisp surface that is easily dry erased for multiple uses. 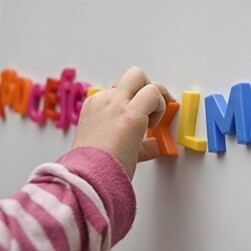 Magnetico also comes in a Soft finish for traditional chalk board applications. Magnetico can be used as a projection screen, making it multi-functional and adaptable for any space. During the manufacturing process, a thin sheet of metal is embedded into the material. This creates a strong finished surface with the ability to hold magnets firmly without moving or slipping. These attributes make Magnetico the go-to writable surface material among architects and designers.